Hello! We are walking for our son Nathaniel. He is eleven years old with Cystic Fibrosis. This is a special year for him because his favorite NASCAR driver is the #11 Denny Hamlin. Did you know that Denny’s charitable foundation raises money for the Cystic Fibrosis Foundation (CFF). 2018 has been a pretty good year overall. 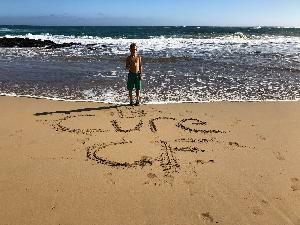 Nathaniel was one of 56 kids worldwide to be accepted into a clinical trial drug, a trial drug that was developed directly as the result of research funded by the CFF. Though it meant regular trips to Riley Hospital in Indianapolis, there was no doubt in our minds that this was the right thing to do. He has gained about ten pounds and has seen a slight improvement in his lung function, so the proof is in the results. However, right at the end of 2018 we learned that Nathaniel had developed a lung infection (pseudomonas). 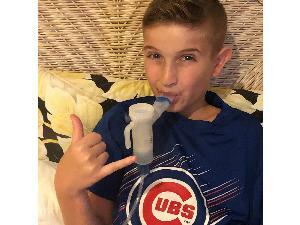 He started a 28 day dose of inhaled antibiotics which doubled the amount of time he has to spend doing breathing treatments to three hours per day. He wakes up early to do his first treatment so he can catch the school bus on time. It’s also the last thing he does before going to bed. Nathaniel's body cannot break down fats or proteins, so he takes over forty pills daily to digest his food, so it can be absorbed. NATHANIEL NEEDS A CURE! No child should have to go through what he does on a daily basis!! There is help for Nathaniel on the horizon. VX-445+TEZACAFTOR+IVACAFTOR and VX-659+TEZACAFTOR+IVACAFTOR are both in phase three of FDA approval and each is showing significant positive results. These drugs both attack the specific mutation that Nathaniel has that cause his CF and we are hopeful that in the very near future these treatments will be available to Nathaniel. IT IS YOUR DONATION DOLLARS THAT ARE FUNDING THIS RESEARCH, AND WITHOUT IT THESE DRUGS WOULD NOT BE DEVELOPED. Nathaniel just wants to be a "normal" kid that can play, eat without medicine, and NO more breathing treatments. He deserve to breathe just like you and me! There are approximately 30,000 Americans living with cystic fibrosis. They are moms, dads, sisters, brothers, daughters, sons, friends and co-workers who struggle every day just to breathe. We walk for them and hope you will support us in our efforts. Real progress has been made in the search for a cure, but the lives of people with CF are still cut far too short. There still is no cure for this devastating disease, but there are drugs on the horizon to control it. Ninety cents of every dollar donated funds research towards finding a cure. By walking today, we are helping add tomorrows to the lives of people living with cystic fibrosis. Will you join us? Support Nathaniel by making a donation to our Great Strides fund-raising campaign today!